Dark chocolate or white chocolate — which one is your favourite? Until recently, white chocolate was a no-no for a healthy low-carb diet but not any more! This is an updated & improved version of my sugar-free white chocolate recipe from the Fat Bombs Book. In my original recipe I simply swapped regular dairy milk powder for coconut milk powder and sugar for powdered low-carb sweetener. I had great results using coconut milk powder. However, not all products dissolve well and some of my readers ended up with clumps of coconut milk powder that separated from the melted cacao butter. In fact, I realised that the vast majority of products contain fillers such as maltodextrin — I was just lucky to find pure coconut milk powder. Fillers like maltodextrin not only increase the carb count but also seem to cause separation in this keto white chocolate fat bomb. The good news is that there is another way to make super smooth white chocolate! 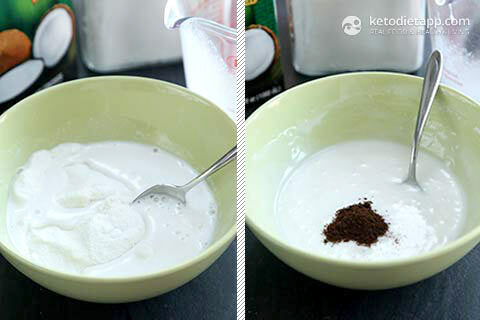 In this new method, I substituted part of the coconut milk powder with my keto condensed milk. The result was super smooth, silky, sweet and delicious. The only drawback is that you will need to keep the chocolate refrigerated, because it gets soft at room temperature. It doesn&apos;t taste just like white chocolate but it&apos;s quite close and will satisfy your sweet tooth. It&apos;s better to use pure coconut milk powder but even if you use one that has some tapioca maltodextrin, it will work and the extra carbs will be negligible. 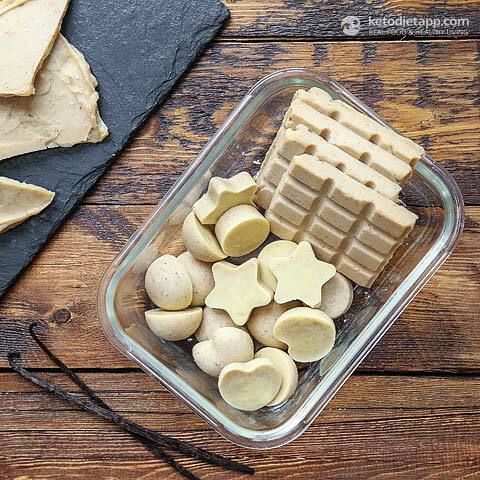 How to use this keto white chocolate? Just like in my original sugar-free white chocolate recipe, avoid using this chocolate in any baked treats unless you also use a stabiliser such as sunflower lecithin, as it would otherwise separate and melt away. The result would be just unappetising and greasy. 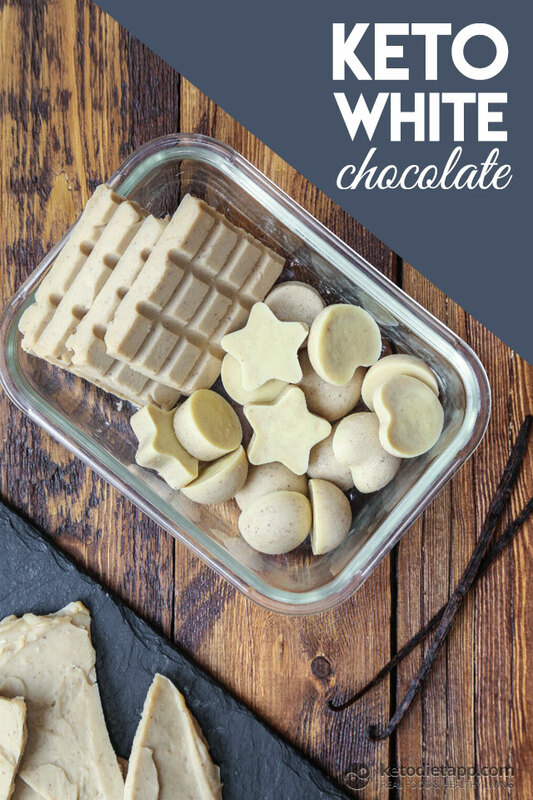 This low-carb white chocolate is great in any cold or frozen treats. It works well as popsicle coating or truffle coating, chopped in any keto granola or keto cereal. Or eat on its own just like you would white chocolate! Note: For my keto white chocolate recipe recipe, I developed two methods. You can follow either one. In the first one, which you can find here, I used coconut milk powder, while in this one, I substituted half of the coconut milk powder with homemade sweetened dairy-free keto condensed milk. If you can eat dairy, you can try my dairy-based keto condensed milk. Note: Sunflower lecithin acts as a stabiliser and will keep the chocolate from separating if you plan to use it for baking. If you can get allulose, use powdered allulose instead of the Erythritol (you can use a coffee grinder to do that). It will result is smooth texture without any cooling aftertaste. Melt the cacao butter in a double boiler, or heat-proof bowl placed over a small saucepan filled with 1 cup of water, over medium heat. Once melted, set aside. 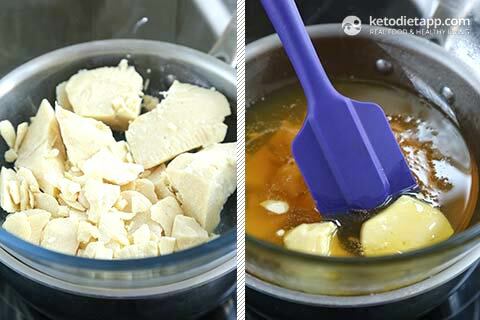 Gently heat up the keto condensed milk (in a microwave or in a small sauce pan). Pour it in a bowl and add the coconut milk powder, vanilla powder (or vanilla extract), and salt. Mix using a spoon until well combined. 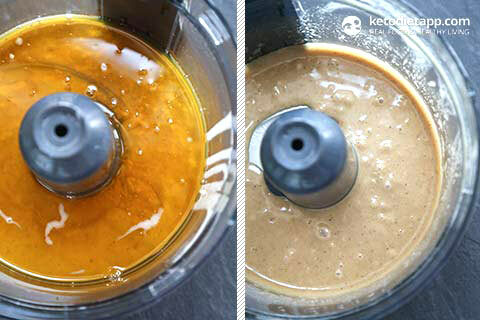 Pour it in a blender or food processor and add melted cacao butter and sunflower lecithin (if using). Process for a few seconds, until smooth and well combined. Pour into candy or chocolate molds (you can find some great ones on Amazon) and let the chocolate harden in the refrigerator. Tip for an extra nutritional boost: Swap 1/4 cup (30 g/1.1 oz) of coconut milk powder for lucuma powder. Lucuma is an anti-inflammatory superfood that will add natural sweetness to the chocolate, and make it creamier. Once solid, remove from the molds. Store refrigerated for up to a week, or freeze for up to 3 months. Do not keep at room temperature. Enjoy! Can I use Coconut milk instead of coconut powder? I'm afraid that won't work because you need to use a powdered product. You could use powdered whole milk - just make sure to count in any extra carbs (the extra carbs per serving will not be too high). One of my readers also suggested powdered heavy cream in another recipe. It may not be available everywhere thought as this suggestion came from the US. This worked out so well! There is a tiny bit of separated cacao butter on top but the flavor is great and the texture is soooo creamy. Not exactly like white chocolate but very very good, much better than any other recipe I've tried. Thank you! It seems to be an issue with white chocolate but the separation should not be significant. In my case it happened on the candy shaped chocolate (you can see about a millimetre of separation on some of them). I poured the mixture for these in the molds while still warm. The bars were done last, and also they are thinner compared to the candies so I think they solidified faster than the candies and didn't allow for any separation. Try bringing the mixture to room temperature, then blend of mix again if needed just before pouring in the molds. 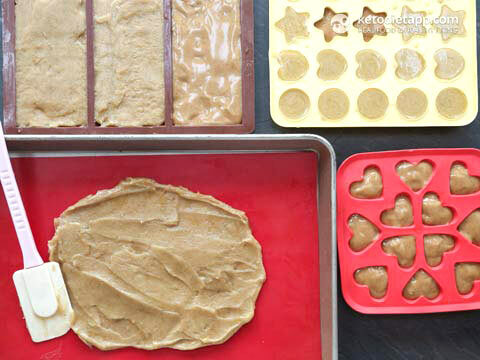 Or put the molds in the freezer so the chocolate solidifies fast. I hope this helps!